A true 12-volt Relay Type Launch Control System, this unit has power to spare. The small compact modular design is a snap to set up. The power is unbelievable. The New Nova is a 12 volt relay type launch control that puts power at your fingertips. It is capable of lighting most any igniter trouble free. Lighting clusters is no longer a problem, the Nova has plenty of power for those Clustered Flights. 1.) 12 volt automotive relay rated at 30 amps guarantees max power to your igniter. 2.) 50 foot control cable (or see options below). 4.) 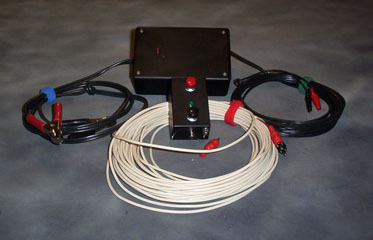 25 foot 18 gauge igniter cable. 5.) 6 foot 16 gauge power cord. 6.) Convenient “fits in the palm of your hand” control box. 7.) 15mA continuity check built into control box. Continuity check is E-Match safe, no “unplanned events”. 8.) NAR and Tripoli approved safety interlocks. 9.) Light weight and easy to transport. 10.) Fast and easy to learn, use and set up. 12.) Guaranteed to be free of manufacturing defects for one full year. Setting the Nova up is a breeze. The relay box sits down at the pad along with the battery; 12 volt Automotive recommended. Stretch the control lead back to the safe zone and plug in the two control leads. Match red to red and black to black. Check continuity with the black button, a green light means the continuity check has passed and the igniter is good. Plug the safety key in and start the countdown. Press the red launch button and see your project roar into the sky. Simple as that. Your launch control is shipped Parcel Post with Delivery Confirmation. We do send shipping notification via e-mail.